Reviewed from copy provided by publisher for Cybils. with her best friend, Julie Marie. in ways she never dreamed. 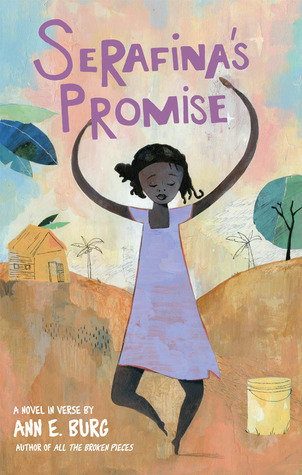 Serafina, a young Haitian girl, wants more than anything to go to school to become a doctor. But her dream seems impossible when she has to spend all day doing chores to help her mother who is about to have another baby. It was the loss of a previous baby and the efforts of a female doctor to prevent it that have inspired Serafina to want to be a doctor. But everything seems to be preventing Serafina from even pursuing her dream: natural disasters, lack of money, and unending chores. Can Serafina find a way to survive and pursue her dream? Not only is the poetry beautifully written but it's surprisingly evocative as well. One of the things that verse can do so well is express the feelings of the characters and Burg does a fabulous job of this. I really felt like I knew Serafina and her dreams and worries, heartaches and joys. In a relatively few words, I also found myself sympathizing with Serafina's parents; Manman who worries so much and Papa, who works so hard to provide for his family and still finds reasons to smile. The characterization is beautifully and tenderly presented. In terms of plot, the story is appealing to me because it highlights the value of an education. Ironically, it also portrays the fact that sometimes when we get what we want, it isn't always what we thought it would be and yet it's the only way to get to where we want to go. The presentation of the natural disasters is thoughtfully and powerfully done despite the sparse use of words, I got a distinct feel for the circumstances Serafina and her family found themselves in. Not that there is any real way to understand what that's like without being there, but this comes close. Overall, a beautifully written and presented story about dreams and overcoming the odds. The only problem I foresee here is the format. Most children won't pick up free verse stories, still if one or two will pick it up I think they will be well rewarded for their efforts. In this children’s picture book, President Thomas S. Monson recounts a Christmas memory from his childhood. As a boy, he yearned for an electric train. To his delight, on Christmas morning he got exactly that a train that operated through the miracle of electricity. Then he noticed a second train that his mother had purchased for the boy down the street whose family was struggling. Although it was only a wind-up train, it had an beautiful oil tanker car, which little Tommy wanted for his own. Soon after, Tommy s mother invited him to accompany her to the neighbor s home to deliver the gift. Young Mark was thrilled with his new train and, of course, didn t notice the missing train car. However, a remorseful Tommy did. What happened next will bring the spirit of Christmas into every heart and home. Illustrated by renowned artist Dan Burr, The Christmas Train is sure to be a classic Christmas story and a beautiful addition to every Christmas library. Includes a QR code for a FREE download of President Monson's narration of the story! Winner of the 2012 Gold Medal Mom's Choice Award! Download the new interactive Christmas Train app for your iPad! The pages come alive with animations, sound effects, and narration by the author, Thomas S. Monson. Kids will love listening to a true Christmas story, read by a familiar voice, while navigating trains, turning Christmas lights on and off, and experiencing the importance of giving during the Christmas season. President Thomas S. Monson was set apart as the sixteenth President of The Church of Jesus Christ of Latter-day Saints in February 2008. He had previously served for twenty-two years in the First Presidency of the Church, after having been a member of the Quorum of the Twelve Apostles since October1963. Five years after his call to the Twelve, he was given a special assignment for the work of the Church in Europe, requiring many visits with members behind the Iron Curtain. He was instrumental in the construction of the Freiberg Germany Temple and in advancing the Lord’s work in other eastern European countries that were part of the communist bloc. He also served as chairman of the Scriptures Publication Committee and supervised the process that resulted in the new editions of the scriptures. His ministry has been characterized by his compassion for the needs of individuals and his gift for one-on-one service. President Monson and his wife, Frances, are the parents of three children, grandparents of eight, and great-grandparents of eight. Dan Burr earned his bachelor of fine arts degree from Utah State University and a master’s degree in illustration from Syracuse University. He and his wife, Patti, are raising their two children in the Teton Valley of southeast Idaho, a setting that provides great artistic inspiration and fantastic fly fishing. Dan is a well-known illustrator, having been in the business for many years, most recently working as a children’s picture book illustrator. A few of the books Dan has illustrated are The Miracle of the Wooden Shoes; God Bless Your Way; A Christmas Journey; and I Heard the Bells on Christmas Day. Some Fun Christmas Picture Books! Review copy provided by publisher in return for honest review. In the middle of a deep, dark forest, all the creatures are fast asleep. Except for a little gray wolf who cant sleep a wink. But the little wolf knows just what he needs to get a good nights sleep: a teddy bear to cuddle, just like in his favorite story book. So the next morning little wolf sets off on an adventure to find a teddy bear. But exactly where do teddy bears come from? The little wolf asks the Wise Owl, but he doesn't know. He asks the Three Little Pigs, but they suggest he speak to Little Red Riding Hood. Finally, when he is very tired the little wolf stumbles upon a kindly man with a bright red suit and a long white beard who needs a helping hand. But good deeds never go unrewarded. So when the little wolf wakes up the next morning there is a soft, cuddly surprise at the foot of his bed...and the answer to his question. 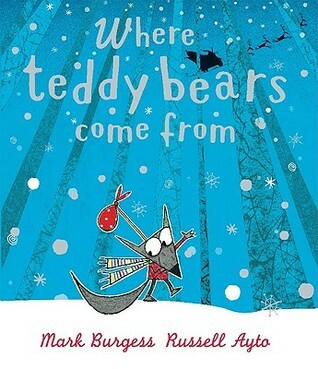 Where Teddy Bears Come From is a delightfully quirky take on several fairy tales but also Santa Claus. The illustrations and text fonts remind me distinctly of Lauren Child's style, but take on a life of their own. The little wolf is quite adorable as he persistently searches for the answer to his question. A fun book to read aloud as the differently sized text prompts the reader into reading with expression and verve. The twists to the fairy tales of the Three Little Pigs (who aren't so little and are female), and Little Red Riding Hood (who is really quite cranky) add a nice humorous touch to the story. It's also fun to wait and see if the reader can figure out that the old guy with the truck that the little wolf stops to help is Santa Claus. Recommended. What does Santa do with his hard-earned vacation time? The same stuff you would do to relax and have fun?and a whole lot more! In this uproarious tale by popular author and Simpsons writer Mike Reiss, Santa recovers from a hectic December by embarking on an hilarious campaign of adventure and self-improvement?from sumo wrestling, to international espionage, to continuing education (including Elf Esteem and Basic Reindeer Labor Laws). But no matter where he goes or what he does, he's still our beloved Santa Claus, as Michael Montgomery's comically classic illustrations reveal. So, thanks, Santa, for all your hard work. Go ahead and take the year off! The concept behind this book is a really cute one. I can see children being really curious about what Santa does when he isn't delivering presents. However, I didn't find the poems quite up to snuff. 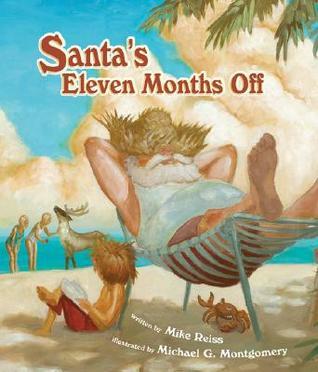 Each poem addresses one of the eleven months outside of December and what Santa is doing during that time. But the poems don't seem to quite connect to each other. Despite that, the book is quite amusing as Santa spends time as a spy, a sumo-wrestler, sports fan, and beach bum. The illustrations really make the book as we get to see Santa doing some pretty amusing things. It's also fun to look for the elf and reindeer in each picture with Santa. Bradley Bartelby is bad, VERY bad. He's greedy and naughty and selfish and spoiled - and Santa Claus knows it. But when beastly Bradley empties his Christmas stocking to find nothing but a pair of socks, he does quite the baddest thing he has EVER tried to do. 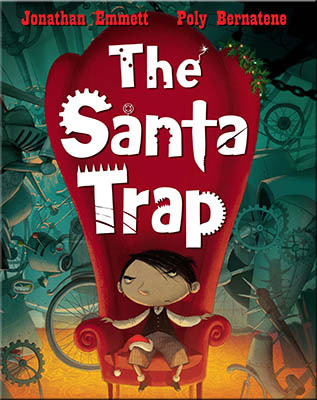 He builds a trap - a SANTA TRAP With guillotines, dynamite and a tiger or two, Santa doesn't stand a chance. Or does he? This book is a winner. All the children I've shared it with have gotten a kick out of it. Maybe it's because of the exaggerated humor, maybe it's because Bradley is so very bad, or maybe it's because it's satisfying to see Bradley get his just desserts, whatever the reason, the book provides an enjoyable reading experience. The text reads smoothly with lots of alliteration and just enough description. The illustrations complement the text perfectly with lots of silly details that children will enjoy looking at and talking about. A kid-pleaser for sure! Highly recommended. It's Christmas eve on the farm where Otis and all of his friends live. The farmer has given Otis his first real Christmas present--a shiny new horn! A tree has been decorated, a big snowstorm is on its way, and all of the animals are excited. Best of all, one of the horses on the farm is about to give birth to a foal! Yet in the middle of the night the horse begins neighing in pain and when the farmer says, "We'd better get Doc Baker out here or we'll lose 'em both," Otis knows the horse is in trouble. Snow has been falling hard for hours and the roads are unpassable. How will they got Doc? Otis to the rescue! He knows a shortcut through the woods and he arrives at the doc's house flashing his headlights and revving his engine. When Doc fails to awake, Otis uses his new horn. Then, with Doc in tow, he races back to the farm just in time for a Christmas miracle . . . and the arrival of a new friend to play with. 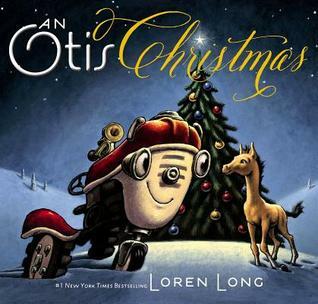 Another fabulous Otis book, I just can't get enough of them. I adore the sweet and courageous tractor who is willing to do anything for his friends. When Otis's friend, the mare struggles to give birth, he sets out for the doctor despite a furious snowstorm. With the help of his shiny new horn, Otis once again manages to save the day in a satisfying way. I have to say though that while I love the story, it's the illustrations that win the day. They are so rich in feeling and color and detail. A wonderful story about friendship and sacrifice great for sharing! Kirby Puckernut is Santa’s cleverest little elf. While dreaming up marvelous toys for good girls and boys, Kirby has his best idea yet – a real elf in every home, all through the holidays, spreading Christmas Magic Santa finds the perfect family and allows Kirby to serve as the test elf for the first momentous visit. Fun and adventure are at every turn, but not everything goes as planned… Will Kirby’s idea be a success? Author Alicia Richardson has created a new Christmas classic with her children’s book, Kirby Puckernut and the Christmas Surprise. Alicia Richardson resides in Salt Lake City, Utah, with her husband and four children. She has always had a flair for storytelling, and has given life to a special little elf named Kirby Puckernut. Willow Chance sees the world through her own very unique point-of-view. She's an avid gardener, obsessed with disease, and loves to count by 7s. But when she loses her adoptive parents in a car crash, her world is shattered. With no relatives to take her, Willow's life becomes full of the temporary; a temporary place to stay (the home of a friend which turns out to be a garage), a temporary break from school, and a temporary, and a temporary sense of family. As Willow struggles to make sense of a world she doesn't understand she finds herself connecting to those around her in new ways. And surprisingly enough, the genius finds herself touching the lives of others in surprisingly permanent ways. Strengths: Willow as a character stands out very clearly. Her strengths and weaknesses are demonstrated in the very text of the story. The text is made up of very short, precise paragraphs, some only a sentence long. This makes for a very straight-forward account of what Willow and those around her experience. The secondary characters also stand out; Mai, the fiery girl who Willow befriends, Mai's troubled brother , Quang-ha, who hates his life and doesn't like Willow, at least at first. Even the adults are quirky and interesting, especially the taxi driver Willow gives advice to, Pattie (Mai's and Quang-ha's mother), and Dell Duke, the school counselor. Weaknesses: This story is very introspective and most of the action is gradual and involves internal struggles manifested through external actions. Many kids may not stick with it because of the lack of direct action. The characters are also a bit strange, too strange for some readers. However, I have no doubt that there is a readership for this book, however small it might be (child readers, adults are already loving this). In October, my debut picture book, DEAR SANTASAURUS, was released. Since then, I’ve been visiting schools and bookstores. It’s been great meeting hundreds of kids and families. It’s also been funny and emotional. Here are some of my favorite moments. I went to visit my nephew’s school. The 2nd graders knew that I was related to their classmate, but one little girl couldn’t remember how. She pointed to my nephew and asked me, “Are you his grandma?” I’m only 30-something. I guess that’s not too young for gray-covering hair dye and wrinkle cream. I got some on the way home. I find preschool visits to be a fun challenge. The 4 and 5 year olds can’t sit still very long, and I’m also distracted by all the nose picking. (I guess it’s a habit that comes with all that not-being-able-to-sit-still.) After reading and playing dinosaur games with the group for 20 minutes, I asked if anyone had questions. A little boy raised his hand and asked, “Can I give you a hug?” Sure! A second later I was mobbed by preschoolers wanting hugs. My eyes welled up. I didn’t even think about all the nose picking germs until after. While I was doing a signing at a bookstore, a boy asked me if he could read my book before buying it. Of course! So he went to the corner and read the book quietly. When he returned it to me, I asked him what he thought about it. “It’s pretty good. But I don’t like dinosaurs.” Then he was gone. At another book store event, a young childless couple was wandering around the kids section. They must have thought I was an employee (even though I was standing behind a table stacked with DEAR SANTASAURUS books and a sign that read, Meet the Author). 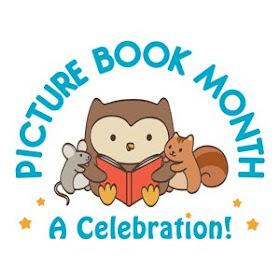 The woman asked me, “Can you recommend a picture book to give as a gift?” Long story short, I’m not a good self-promoter. The couple ended up buying Mustache Baby by Bridget Heos. I gave them a free dinosaur sticker. What’s the biggest dinosaur? At an event at a children’s museum, I told the kids that it was the Argentinosaurus. (I just looked it up, and I may be wrong on this. But the Argentinosaurus is in the top three.) Well, one little boy insisted it was the T-Rex. For five minutes, we debated. I told him the T-Rex was large, powerful and is very popular, but T-Rex is not the biggest. The boy told me I was wrong. Over and over and over. Eventually, I conceded. I think it was the right move. 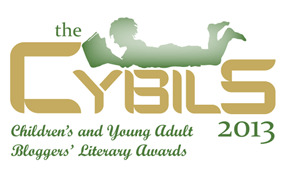 Review copy provided by publisher for Cybils. Bennett Robinson loves baseball, especially watching Dodgers’ games with his dad while munching on burgers and fries—the perfect “game food.” Baseball even helped Bennett and his dad get over his mom’s death from cancer. But there’s no way Bennett could ever play baseball. Bennett is fat, the kind of fat that gives you belly button sweat stains and makes it tough to get off a saggy couch. But on one perfect, baseball-watching day, everything changes. Bennett’s dad is taken away on a stretcher, and Bennett doesn’t know if he will live or die. Now Bennett has to move in with know-it-all Aunt Laura, his mom’s sister, who hates Bennett’s dad. And Aunt Laura is making it her personal mission to Get Bennett Healthy. Bennett knows that Aunt Laura will take over his entire life if he lets her. It’s time for Bennett to step up to the plate. Because maybe there are some things a fat boy can do. I really, really liked this book. Not only are there some great characters, but it just feels very genuine; real people with real problems. Bennett faces some of the normal challenges for an 8th grader, but he also faces bigger challenges. Not only does he have to deal with a nasty bully, but his father just had a stroke and his Aunt Laura is determined to get him healthy, whether he wants to or not. Like most middle graders, it irritates him to be told what to do. 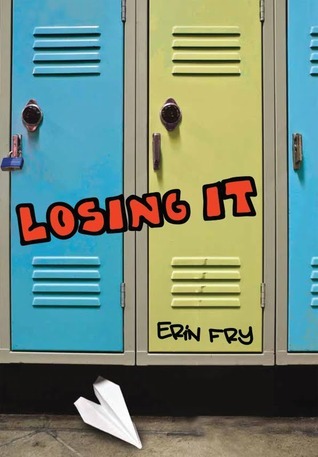 But Bennett doesn't want to end up like his dad either, so he decides to join the cross country team, despite the disbelief of his best friend, P.G. and his own doubts that he can do it. He's way overweight and running is very difficult for him, but as he faces his doubts and fears he learns that sometimes it doesn't matter if you finish last, as long as you finish. Bennett is such a likable main character, pretty easy going, pretty comfortable in his own shoes at least until his father ends up in the hospital. I appreciated having a main character who isn't gorgeous, fit and popular, but more like the rest of us with problems and challenges. I also liked that a cute girl liked him despite his shape and size, just because he's very likable. P.G., Bennett's best friend is also a great character who is afraid that as Bennett changes they won't be able to relate any more (P.G. is overweight too), but who comes through when Bennett most needs him. Bennett's relationship with his dad changes after the stroke and it's sweet to see its development. The fact that Bennett's problems aren't all fixed by the end of the book provides a realistic and acceptable ending. I think above all what I liked about the book was how easy Bennett is to relate to, he felt very real and I couldn't help but root for him. Highly recommended and very readable. Quinn has been called a superhero and a freak of nature. At age 13, he's an amazing distance runner. He takes on the second-hardest challenge of his life when he enters his first ultra marathon: a grueling 100-mile, 24-hour-long race that will push him to the very limit of his endurance. While Quinn struggles to go on — up a mountain and through the night, as his muscles break down and he begins to hallucinate — we learn why the ultra-marathon is only the second hardest thing he has endured in his young life. And maybe this devastating event from his past is exactly what Quinn has been running from . . . 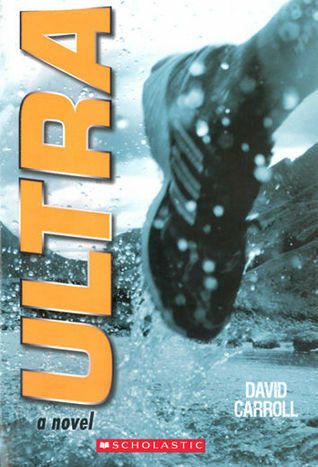 Framed as an interview with a media commentator after Quinn's newsmaking finish, this remarkable debut novel from ultra-marathon runner David Carroll reminds us that when we dare to challenge what is possible, the word impossible loses its meaning. I wasn't sure I was going to like this one at first because I'm not much of a runner and the whole book focuses on the running of a 100-mile ultra marathon. But I ended up liking it quite a bit. Quinn is a likable protagonist with a lot going for him. The idea of Quinn's physical quirks making him a 'superhero' I found quite appealing. The way the story gradually develops and the reader learns why Quinn entered the race and what led up to it keeps the story moving along at a nice clip and is sure to hold the interest of young readers. The interview segments give the reader hints of what is to come along in the story and also provide a little extra explanation of certain things that Quinn experiences, although this format may not appeal to all readers. I did find the parts where Quinn is hallucinating rather weird, which I guess is the point, hallucinations by their very nature are weird. But interestingly, they also foreshadow a little bit the emotional struggles that Quinn has had over the last year. Quinn's relationship with his best friend, Kneecap, was both funny and touching at the same time, yet full of ups and downs like any relationship. 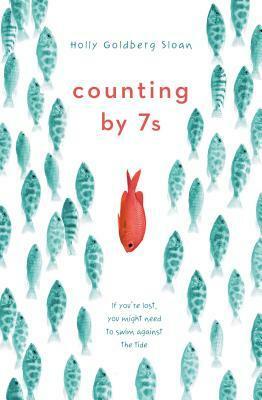 While the writing wasn't as detailed as I would have liked, I think it works well for the reluctant reader who so easily gets bogged down in too much detail. A book I can easily recommend to young readers, who should be able to relate to Quinn regardless of their interest in running. Best friends and seventh graders Sophie Young and Grace Yang have made a game out of spying on their neighbors. On one of their midnight stakeouts, they witness a terrifying, bloody scene at the home of their bizarre middle-school counselor, Dr. Charlotte Agford (aka Dr. Awkward). At least, they think they do. The truth is that Dr. Agford was only making her famous pickled beets! But when Dr. Agford begins acting even weirder than usual, Sophie and Grace become convinced that she’s hiding something—and they’re determined to find out what it is. Soon the girls are breaking secret codes, being followed by a strange blue car, and tailing strangers with unibrows and Texas accents. But as their investigation heats up, Sophie and Grace start to crack under the pressure. They might solve their case, but will their friendship survive? Sophie Young and Grace Yang are quite different. Sophie is short, blond and freckled and cares nothing about fashion but loves Chinese culture. Grace is tall, slender, of Chinese ancestry and is obsessed with fashion as well as becoming an FBI agent. 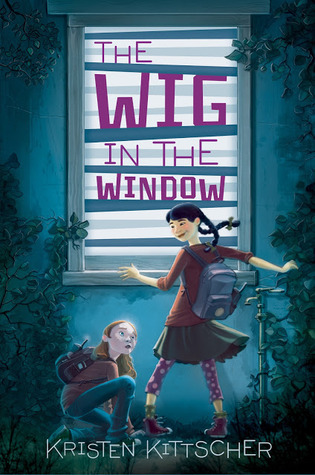 When Grace convinces Sophie to spy on their neighbor, Charlotte Agford, who also happens to be Sophie's school counselor, neither expects to find much. But after getting caught and being forced to spend time with the good doctor, Sophie becomes convinced that something isn't right. But what can two twelve-year-old girls do, especially when it seems the real FBI can't or aren't doing anything? And is Dr. Agford really hiding what they think she is hiding or is it something much less incriminating? And above all, will their friendship survive all the tension and sneaking around? Especially when Sophie makes a new friend at school. Strengths: I appreciated how different Grace and Sophie are and yet how they balance each other out. The mystery has some entertaining twists and turns to it and the climax is definitely exciting. It's nice to read a stand-alone mystery that's different than the typical formulaic fare so common today. I also liked how the girls used real research to look for answers. The girls also had to face the consequences for some of their foolish decisions. Weaknesses: The story isn't completely believable and the girls do some remarkable dangerous and irresponsible things, I mean sneaking into someone else's house? While their intentions are good, their choice of means aren't good ones. Kids aren't likely to care about this stuff though and the girls do face consequences for some of their choices, although not all. 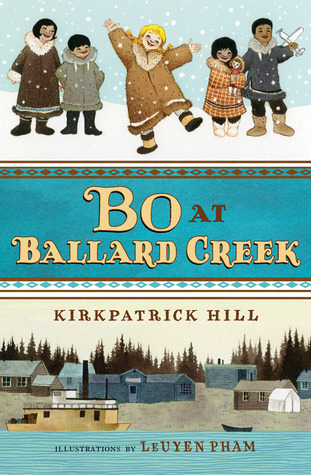 It's the 1920s, and Bo was headed for an Alaska orphanage when she won the hearts of two tough gold miners who set out to raise her, enthusiastically helped by all the kind people of the nearby Eskimo village. Bo learns Eskimo along with English, helps in the cookshack, learns to polka, and rides along with Big Annie and her dog team. There's always some kind of excitement: Bo sees her first airplane, has a run-in with a bear, and meets a mysterious lost little boy. Here is an unforgettable story of a little girl growing up in the exhilarating time after the big Alaska gold rushes. Five-year-old Bo lives with Jack, an African American cook and Arvid, the mine blacksmith who adopted her when her mother rejected her. She loves the village she lives in and spends her time helping Jack in the kitchen and visiting the neighbors. Bo does have her share of challenges though, everything from sickness to bears and lost little boys, but with the help of her friends and adopted family she manages to make her way through. Strengths: Bo is a darling little girl with lots of heart and people that care about her. The details about the time and place are vivid and interesting. Pham's illustrations provide a nice touch help show what Bo and her family and friends are like. I really enjoyed this one, just a cute story about growing up in a specific time and place and the challenges and changes associated with Alaska in the 1920s. I also appreciated how careful the author was about including certain details like the 'good-time' girls. No further information is provided other than their presence in helping the miners have a good time. The book is well-written and easy to read. I personally loved the book. Weaknesses: I'm really not sure why the author made the main character only 5-years-old. It's an unusual age for the main character of a middle grade novel. Would be fun for a family read-a-loud, but I am not sure how many children will pick it up on their own, especially since it is historical fiction as well. Some of the mining details may not be appreciated by the target audience. Also, it doesn't have a really exciting plot like so many kids want to read these days. There is also a bit of bad language which isn't necessary, although probably realistic relating to the time and place. When Billy Miller has a mishap at the statue of the Jolly Green Giant at the end of summer vacation, he ends up with a big lump on his head. What a way to start second grade, with a lump on your head! As the year goes by, though, Billy figures out how to navigate elementary school, how to appreciate his little sister, and how to be a more grown up and responsible member of the family and a help to his busy working mom and stay-at-home dad. Newbery Honor author and Caldecott Medalist Kevin Henkes delivers a short, satisfying, laugh-out-loud-funny school and family story that features a diorama homework assignment, a school poetry slam, cancelled sleepovers, and epic sibling temper tantrums. Illustrated throughout with black-and-white art by the author, this is a perfect short novel for the early elementary grades. 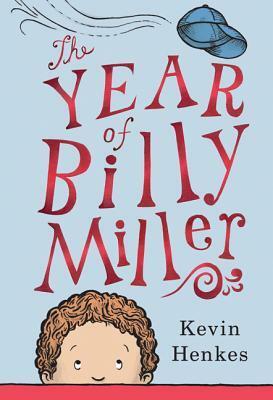 Billy Miller struggles with finding his way through the sorts of problems one would expect for a second-grader. He starts school on a wrong note and seeks to remedy the problem with his teacher. His father's artistic block causes tension in the family until Billy finds a way to help. Billy wants to stay up all night and hopes his little sister can help him do it. But who is he supposed to write his special poem about when he loves both his mom and dad? It's a puzzle, but Billy addresses the problem with his typical aplomb. Strengths: Billy is an adorable character, very believable and endearing. Henkes demonstrates once again his superb understanding of childhood and the sorts of things that most kids worry about. The book would be a wonderful read-a-loud as it is full of character, heart, and beautiful writing. Weaknesses: The only problem I had with the book was the length. The book is rather long (229 pages) for the target audience which would have to be first through third grades. I'm not sure older children would pick up the book. Nate Foster has big dreams. His whole life, he’s wanted to star in a Broadway show. (Heck, he'd settle for *seeing* a Broadway show.) But how is Nate supposed to make his dreams come true when he’s stuck in Jankburg, Pennsylvania, where no one (except his best pal Libby) appreciates a good show tune? With Libby’s help, Nate plans a daring overnight escape to New York. There's an open casting call for E.T. : The Musical, and Nate knows this could be the difference between small-town blues and big-time stardom. Nate Foster wants to be on Broadway more than anything. His family doesn't understand this and so when the opportunity to audition for E.T. : The Musical arises he can't pass it by. But it means leaving home on his own while his parents are away. But like most good plans, things go awry right from the beginning. He gets soaked walking down the street, his new clothes don't fit, and he needs an guardian in order to audition in the first place. The unexpected arrival of his Aunt Heidi, who he hasn't seen in years, at first seems like bad luck, but may turn out to be much more. Nate must decide just how much he is willing to risk for the chance of a lifetime. Strengths: The voice is honestly and humorously done. 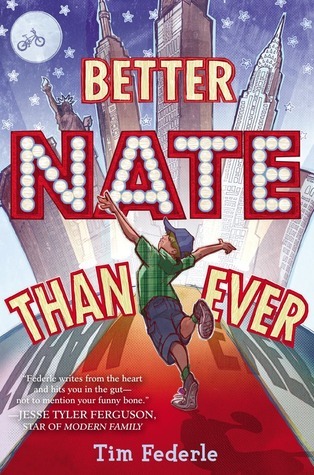 Nate's sense of humor helps him deal with the bad things in his life like bullying, being overlooked by just about everyone, and his short stature. Broadway isn't a topic I've ever seen done in children's fiction before so it's a nice addition. Weaknesses: The profanity, swearing, and sexual references made me uncomfortable. This isn't a book I would feel comfortable putting in an elementary library. Plus, a thirteen-year-old on his own in New York City made me a bit nervous. And I understand Nate's wanting to save his relationship with his brother (not that they have much of one), but his brother's underage drinking shouldn't be kept a secret. Zoe and Zak are lost in exotic India, where gods and magic still exist. Before they can find their way home, they just have to do one little thing… …Save a mythical creature from an ancient evil that wants to rule the world. When Zoe Guire goes along on her mom’s business trip to India, things get very weird, very quickly. An elephant god speaks to her from the bottom of a swimming pool… She and her classmate Zak get locked in a trunk and shipped off to a strange city near the foothills of the Himalayas… and a crazy snake charmer tells them they’ve been chosen to protect a mythical creature called the Ghost Leopard from an ancient evil that wants to take over the world. As they travel deeper into the majestic mountains known as the Realm of the Gods, things get even weirder. If she and Zak want to make it back to their parents, they’re going to have to tap into powers they never knew existed. Because if they don’t, things will never be the same for any of us ever again. I went to high school in the Himalayan mountains in India. I did a lot of hiking there. Once we hiked very high into the mountains and a snow leopard visited our camp. This story sort of builds off of that experience. What were the best/worst things about living in India? The best thing was that everything was new and interesting. I was young so I also felt a great deal of independence living on my own, without my parents. I would have to say that the worst thing was the food. Indian food can be great, but at the school I went to, at that time, it was pretty bad. Do you have a special place that you like to write? If so, where and why? I often write on the couch because it feels a lot less like working than sitting in my office. There is a view of the ocean from the living room which always brightens my mood. What are your favorite/least favorite things about being a writer? My favorite thing is that you can create an entire world on the page out of nothing. I suppose my least favorite thing is just how much work it takes to transform those initial thoughts into a finished product. I'm currently working on the third thriller in my Michael Chase spy thriller series. This book ties together all the threads introduced in Letha Circuit and Blown Circuit, so I'm happy to have the chance to answer a lot of outstanding questions. What do most enjoy reading? I like to read all sorts of thrillers and adventure books. The truth is, I'm not picky. I read really broadly. Fantastic Press is pleased to announce that Lars Guignard will be answering questions about Zoe & Zak and the Ghost Leopard throughout the day on Monday, December 16th, 2013 on Goodreads. If you have any questions for Lars or just want to introduce yourself, you can head on over to Goodreads and say hello now. Also, everyone who joins the Forum will earn an entry into the Ghost Leopard Blog Tour giveaway (see below for more details). Click on the Goodreads Button below to go to the Mon, Dec 16 - "Ask Lars Guignard about Zoe & Zak and the Ghost Leopard" event and leave a question for the author anytime from now until December 16th, 2013. Prize: Three winners will receive a print (U.S. & Canada) or electronic (international winners) copy of Ghost Leopard by Lars Guignard. Terms and Conditions: NO PURCHASE NECESSARY TO ENTER OR WIN. VOID WHERE PROHIBITED BY LAW. The winners will be randomly drawn through the Rafflecopter widget and will be contacted by email within 48 hours after the giveaway ends. The winners will then have 72 hours to respond. If a winner does not respond within 72 hours, a new draw will take place for a new winner. Odds of winning will vary depending on the number of eligible entries received. This contest is in no way sponsored, endorsed or administered by, or associated with Facebook. This giveaway is sponsored by the author Lars Guignard and Fantastic Press and is hosted and managed by Renee from Mother Daughter Book Reviews. If you have any additional questions - feel free to send and email to Renee(at)MotherDaughterBookReviews(dot)com.